My kids had no idea. They played it cool. They had changed time zones, in a small way, exactly once. Vancouver to Orlando. 3 hours. They were quite young, then. And they we were on vacation, mainly at the Disney parks. So this was altogether different. This time, they were in for something else. First we had a small layover in Montreal, where they remarked how strange it was to be eating dinner so early. I kind of chuckled, they had not seen anything yet. For it is an indescribable feeling when your body is usually asleep and your mind is keeping you awake. Our crossing over the Atlantic took us a little North and a lot East, over the Atlantic ocean. We chose the direct flight service offered by Air Canada Rouge. It is a little bit of a no frills kind of thing, as compared to the regular planes, where I have flown most of my miles. On a business trip, I prefer the opportunity to upgrade to the lay flat seats. (Not that I am used to it, because it was still a treat every time it happened!) However, for a personal trip, Rouge is just great. There was an option to upgrade into premium seating and since this was such a special first flight, I took it. With a bunch of adrenaline flowing, we settled into the trans Atlantic flight. Since I have done this kind of trip so many times before, I knew full well how I would feel once we landed. Even with a nicer seat and my fancy new neck pillow, there is no accounting for the ambient noise and motion of the airplane experience. Yes, you arrive with lightening speed, compared to the old days of ocean liners, but your body pays the price. But the kids didn’t understand how important it would be to try to get as much sleep as possible. As I tucked myself in for a fitful rest, my other 3 family members were still watching videos. After what I figured was about 3 hours of twisting and turning in my seat, looking for that elusive comfortable place for my legs and feet to relax, I woke up fully. It was 2am in Montreal. It was light outside. It was 8am in Barcelona. It was time to be awake. Slowly, my family also emerged from whatever kind of sleep they had managed to relax into. Then we got our first look at Barcelona, from the airplane window, on descent. Another surge of adrenaline seemed to lift the spirits of my son, but my daughter was beat. She felt as if she had not slept and was dragging pretty badly. We sailed through all the formalities and there were no lines at border control. After a short exploration, we had new sim cards installed in our phones. Off to the taxi, we made our way into the heart of the city and the location of our flat. After the formalities of getting settled, my daughter found her bed and crashed. In truth, she had already been half asleep on the sofa while we chatted away with our AirBnB host. We were down 1, but the rest of us had to eat. Off we went to explore and find some tapas. My son commented on how surreal it was to be here, in Barcelona. He went on to remind us that he still felt very strange, tired but awake, walking around. We knew, my husband and I. Once the excitement of arriving fades, an extreme fatigue is usually right behind. It is a strange feeling to be sure. One that can be counted on. For all the trips I have completed, that wash of tiredness is a faithful companion. Always tagging along for the ride. Once we arrived back home, nice hot showers, all round. Super fast wifi, some food and drink, we had a happy family. The only problem at that point was to stay awake, long enough. I went down first. My husband was nodding off sitting at the kitchen table. But he managed longer. I’m not sure what time they all hit the hay. I was up, rolling around from about midnight until after 2 am. Then, the next thing I knew it was 10 am. An average first night for me. We let the kids sleep until after noon. That is normal for them, if we allow it. Tonight will be a tough one, always is. One day for each hour of time zone change, to adjust to the new location. That is the rule of thumb. The kids did not like to hear that. What they don’t realize is, with each day, the effect of the adjustment is felt less acutely. I like to think of us adapting. To this new place, to this new life. A life on the road. We still have many attachments to our normal way of doing things, but we are successfully building new skills as we go. Adjusting our expectations down in some ways and finding delight in new experiences, as well. 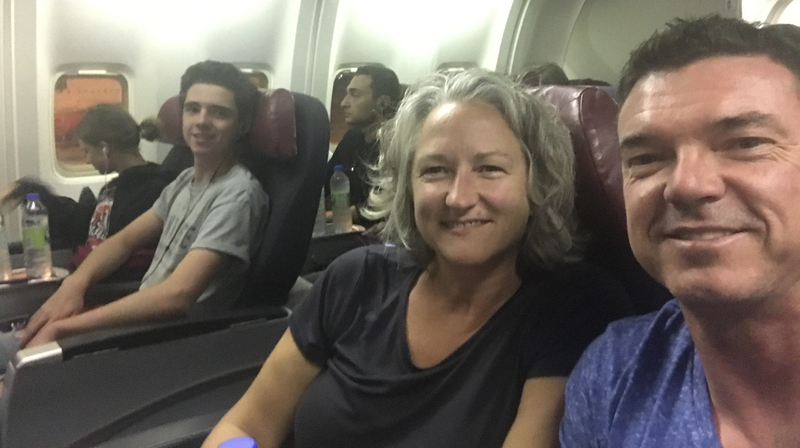 If nothing else, our teenagers are gaining a new understanding of what long haul travel is really like. All the years and all the trips, my husband and I have done don’t seem quite so glamorous to our kids right now, in the depths of jet lag. Of course this fades. Soon, these 2 will be seasoned travellers, with their own techniques for coping with the effect of changing time zones. (See 23 Real Struggles That Anyone With Jet Lag Will Understand).